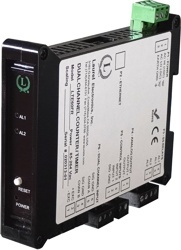 This Laureate transmitter accepts two independently scalable input channels A & B from a wide range of pulse sources, such as NPN or PNP proximity switches, contact closures, digital logic, magnetic pickups down to 12 mV, or AC voltages to 250 Vac. Input frequencies can range from 0.005 Hz to 1 MHz. Arithmetic functions A+B, A-B, AxB, A/B or A/B-1 are made available by the Extended counter main board and can track the sum, difference, product, ratio, or draw of both input channels. These functions can be applied to scaled rates, scaled totals, square root of rates, totals after square root extraction, custom curve linearized rates, or totals after custom curve linearization. Sum can be used to add two flows for total flow, or to add the number of parts carried by two conveyor belts. Difference can be used to subtract outflow from inflow for net flow, or to subtract reject parts from total parts. Product can be used to multiply two rates, for example to compute horsepower by multiplying torque by RPM. Ratio can be used to compare flow rates in two channels, the RPM of rollers or gears, or the speed of moving machinery, such as conveyor belts. Ratio can also be applied to scaled totals to compare two batches to be mixed. In this application, one transmitter is used to monitor the ratio of flow rates, and a second transmitter to monitor the resulting batch totals. Draw is obtained by subtracting 1 from ratio. Draw is used to measure the elongation of material as it passes between rollers, or to monitor variation in the speed of rollers for tensioning. Exceptional Accuracy and Stability. Laureate pulse input frequency and rate transmitters determine frequency by taking the inverse of period as measured with a calibrated quartz crystal time base. Extremely accurate 6-digit internal readings (±999,999 counts) are processed in software. The update rate of the transmitter output is a programmed gate time + 30 ms + 0-2 signal periods. For pulse rates of 60 Hz and above, the update rate would be 20 per second. Such fast update rates are ideal for alarm and control. Transmitting and alarming the input flow rate ratio of two fluids (gas or liquid) allows these to be mixed in a predetermined ratio in continuous processes. The sensing element is normally a turbine flow meter, which outputs pulses at a frequency proportional to flow rate. The A/B ratio can also be transmitted for totalized rate (or delivered volume). The ratio of the inflow and outflow rates of a tank is a measure of the relative filling or emptying rate. The same transmitter can also be programmed to transmit the net inflow or outflow rate in flow units, or to transmit totalized inflow our outflow in volume units. Any of these parameters can be alarmed using the dual relay board and be transmitted via 4-20 mA. In this application, Channel A measures the rate at which a coating material is applied, as measured by a flow meter, while Channel B measures the speed of the film based on pulses from a proximity switch. Transmitting and alarming the A/B ratio assures that an even thickness of coating material is applied as the speed of the film is varies. The dual-channel Laureate transmitter can measure the speed of conveyor lines by using the output of proximity switches which sense gear teeth or spokes of rotating drive wheels. Transmitting the speed ratio of two lines allows line speeds to be adjusted so that material arrives at work stations when needed. Draw (Ch A / Ch B - 1) can be used to indicate the elongation of films compressed between rollers, the shrinkage films, and the RPM difference of rollers whose speed is varied to maintain tension. The high resolution of Laureate dual channel transmitters is ideal for comparison of rates that are close to each other.